The word of the day is "awful". That's the best description of today's durable goods report. Durable goods orders came in at -1.2% lower than the Bloomberg Consensus Estimate of 1.0%. And last month's numbers were revised lower across the board. There is no way put lipstick on that pig. The factory sector is showing cracks with orders contracting slightly more than expected, down 1.2 percent in September with August's contraction revised lower to minus 3.0 percent. Other readings are likewise weak with ex-transportation down 0.4 percent following a downward revised 0.9 percent decline in August and with core capital goods orders down 0.3 percent after falling a downward revised 1.6 percent in August. Other readings include a second straight and sharp 0.6 percent decline in unfilled orders and a third straight decline in inventories, down 0.3 percent which is the sharpest decline since May 2013. The decline in unfilled orders suggests that factories, lacking new orders, are working down backlogs while the decline in inventories points to growing caution in the business outlook. But factories are keeping up shipments which is good for GDP, up 0.2 percent after August's 0.5 percent decline with core capital goods shipments up 0.5 percent after a 0.8 percent decline. Motor vehicles are a positive in the report, showing a 1.8 percent gain in new orders and a 1.6 percent gain in shipments with both reversing similar sized declines in August. Also positive are electrical equipment and fabricated metals, with both perhaps getting a boost from construction, along with defense aircraft and defense capital goods. Industries showing declines in new orders include primary metals, machinery, and computers & electronics. Orders for civilian aircraft fell 62 percent in September following a 23 percent decline in August. This report falls in line with industrial production data where manufacturing in September slipped for the fourth time in five months. Weakness in exports is the balancing factor tipping the factory sector away from growth. 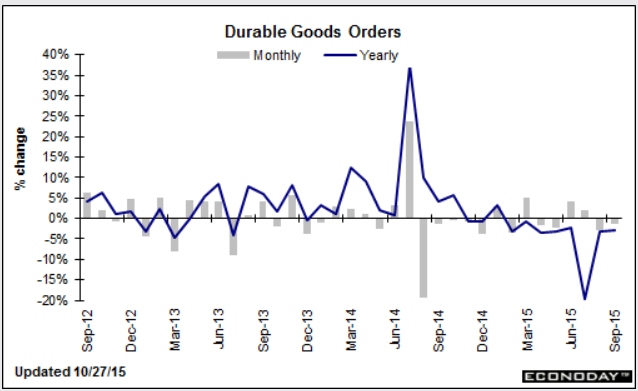 Year-over-year, durable goods orders are down for the eighth consecutive month, and tenth out of the last eleven. Manufacturing is clearly in recession.